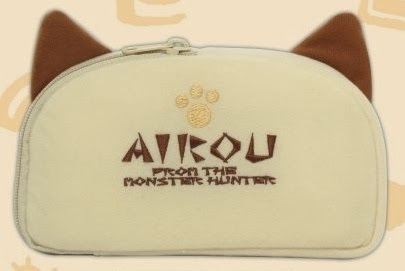 That's because I'm going to buy one of the Monster Hunter airu (felyne) pouches seen below as soon as they're available--which will be at the end of March, according to play-asia.com. Actually, my current plan is to pre-order it via amiami.com so it can be shipped along with my copy of Kumamon ★ Bomber: Puzzle de Kumamon Taisou, also releasing sometime next month. As much as I like the front of this particular 3DS LL/XL pouch, I like the reverse even more--thanks in large part to the "From the Monster Hunter" message splashed across its backside. You nearly made me spit out my coffee, Chief! How is that Monster Hunter game? I was on the fence about a purchase (esp. when it was just twenty dollars), but found the PSP version to be a little off-putting. I haven't played it yet :| I'm aiming to start it soon, though. Of course, Bravely Default will soon be in my possession, so we'll see if that actually happens. Anyway, I'll do my best! 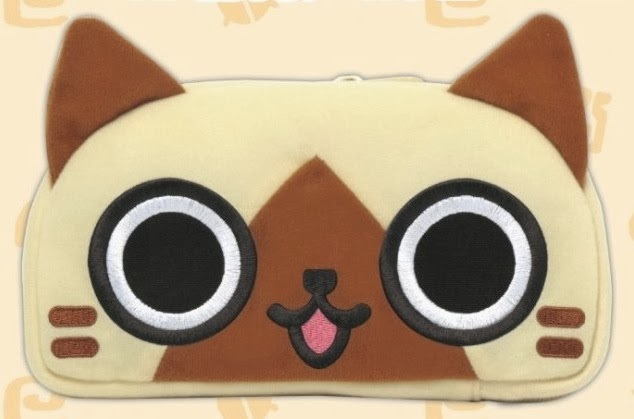 So, you have a PSP case that looks like this? And you like it? Someone else pointed out on Twitter yesterday that a melynx one was released for PSP. Kind of wish there was a melynx one for the LL, too, but I'll take what I can get! Ah, yes, I understand. The lite certainly is/was portable! Yep, I've got a PSP one that looks pretty much the same. It does the job but the padding isn't particularly thick or anything. I haven't seen the Melynx one! Just a warning but Monster Hunter's beginning is slow. I can't remember if it was you who was wishing you can turn off the voices in Bravely Default. You can under the sound settings. Warning noted, Sam! Of course, I've yet to start MH3U, but I'm hoping to do so before the month ends. Thanks for the note about BD's voices, too. I just got my copy today, although I won't even open it until this weekend. I have to get through more of Sweet Fuse (PSP) before then! Ha! That's definitely ... interesting. Cute, yes, but also kind of creepy. I'm not even sure why. Anyway, thanks for sharing it!